This eight ingredient Shrimp, Bacon and Kale Parmesan Pasta makes any dinner special and comes together in just 30 minutes. Your favorite pasta is dressed in balsamic vinegar and olive oil and studded with sauteed sliced onions and chopped kale. Everyone then gets the opportunity to top their bowls with popcorn shrimp, crispy bacon and a shower of Parmesan cheese. I don’t know if I’m crazy or what, but when school gets cancelled for the day due to Winter weather, I swear I’m happier than my children are. While they’re complaining that they want to go to school to learn more about space – that was the 6 year-old’s latest complaint – I’m celebrating a day that I’ll get to spend in yoga pants and doing things snuggled in at home. 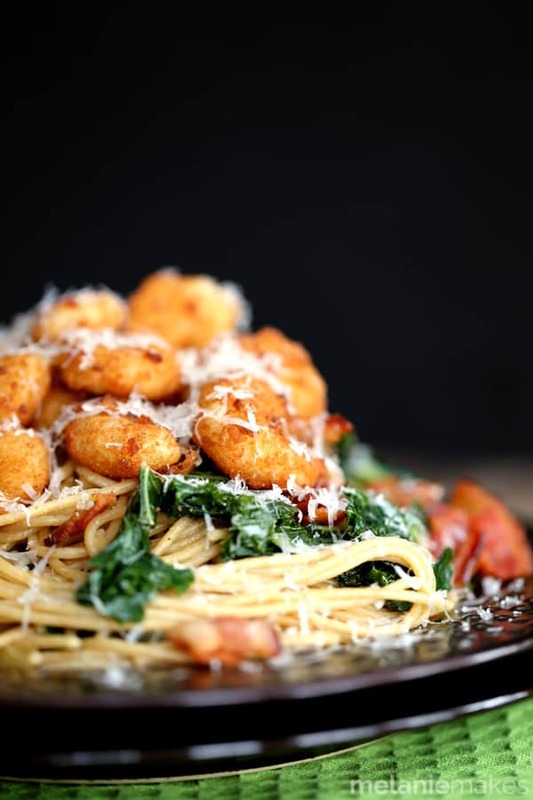 This Shrimp, Bacon and Kale Parmesan Pasta? This happened to be what I served for lunch on our last snow day. What? You typically don’t feed your children shrimp for a weekday lunch? I like to joke with our menagerie that they’re so lucky that their mama enjoys cooking for them so much but really this pasta dish is so easy it comes together in just 30 minutes thanks to ingredients that are typically in our pantry, fridge and freezer. And that shrimp I mentioned? It’s from SeaPak and always at the ready in the freezer to be added to dishes or to be the star of the show. 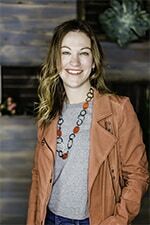 I love that they have strict quality, sourcing and sustainability standards for their products, including a commitment to source only from suppliers whose practices limit negative environmental impact. You would’ve loved to hear the conversation with our daughters and I about popcorn shirmp as I was preparing lunch. “Do you have to pop it like popcorn?” “Where did the shrimp come from?” Who says spending time in the kitchen isn’t a learning experience! 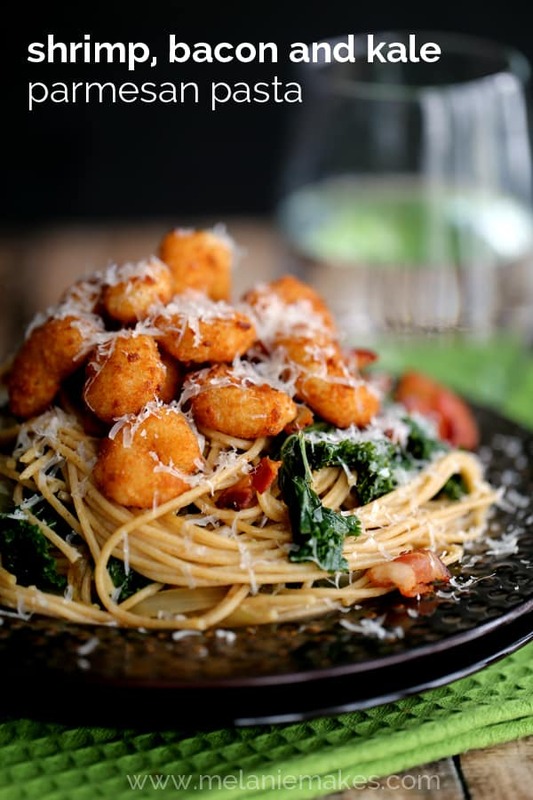 Your favorite pasta – I used a whole wheat spaghetti – is dressed in balsamic vinegar and olive oil and studded with sauteed sliced onions and chopped kale. 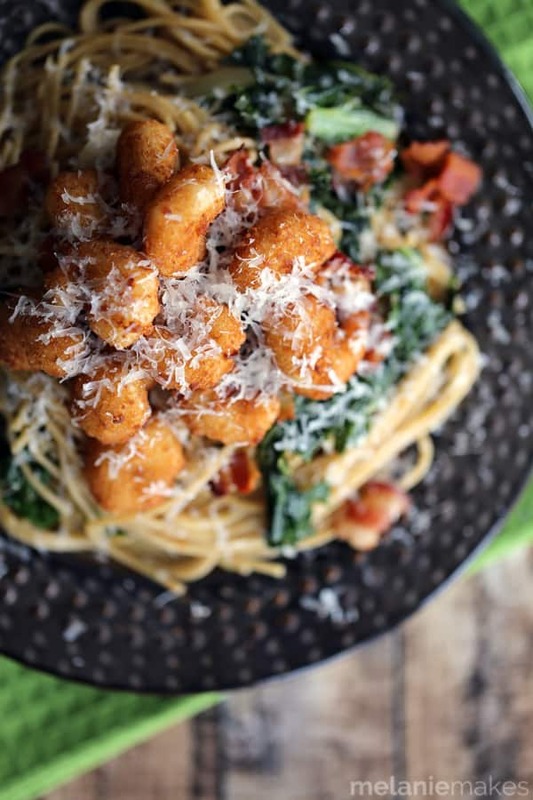 Everyone then gets the opportunity to top their bowls with popcorn shrimp, crispy bacon and a shower of Parmesan cheese. The more toppings the better! This eight ingredient main dish makes any dinner special and comes together in just 30 minutes. Prepare pasta according to package directions, cooking until al dente, reserving 1 cup of pasta water. Meanwhile, bake shrimp according to package directions. Using kitchen shears, cut bacon into 1/2" slices and cook in large heavy skillet until crisp. Transfer to plate to drain. Reserve two tablespoons of bacon drippings in skillet and saute onion until beginning to soften, around 5 minutes. Add kale reserved pasta water and season with salt and pepper. Toss together until kale is wilted, about 5 minutes. Add vinegar. Add pasta and oilive oil to skillet and toss to coat. 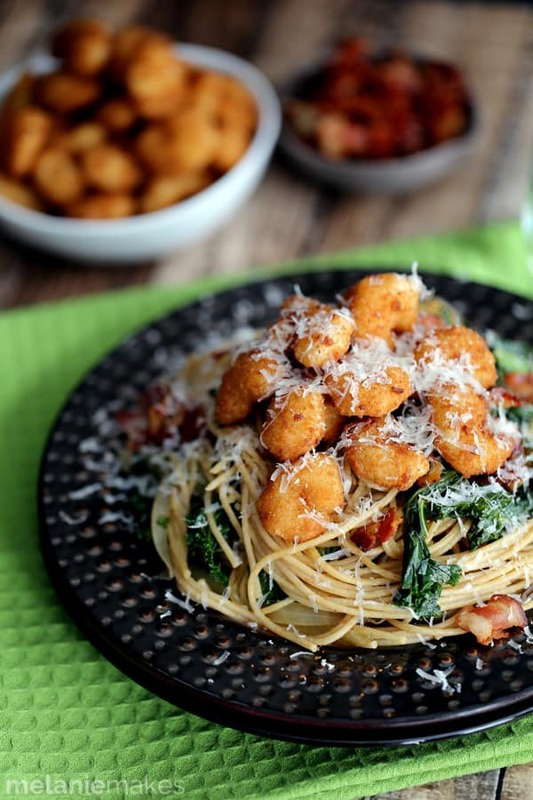 To serve, add pasta to each bowl or plate and top with shrimp, bacon and Parmesan cheese. No matter what your thoughts were before, wouldn’t you know agree that snow days are the best days? Especially if that means trading in multiple trips to school in favor of shrimp for lunch! 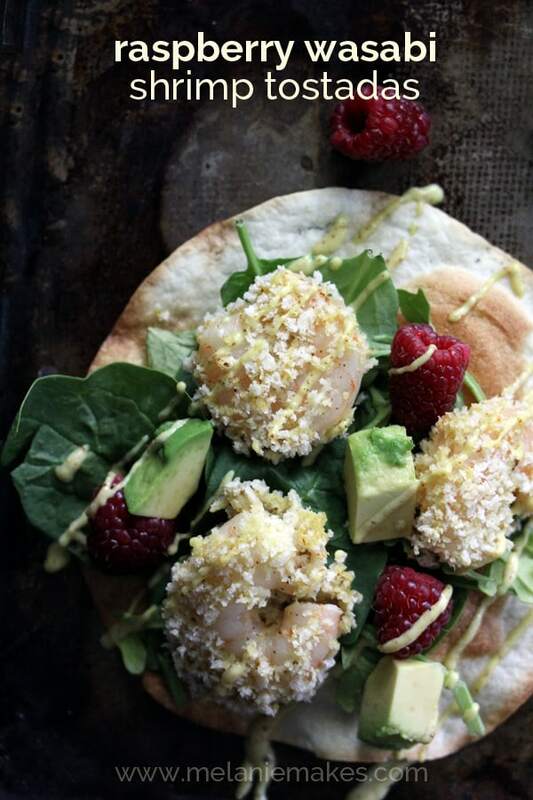 Your photography captured all that deliciousness in this recipe! This will surely be a hit in our house! Thanks for sharing! What a great looking lunch, your kids are very lucky! My family would absolutely love this. I'm always happier when school gets cancelled too, it's nice to have a few laid-back days. This pasta is calling to me. Love the breaded shrimp and bacon combo. I can't wait to give it a try. Kale, pasta, bacon and shrimp are what I live on!! No, really. I do. 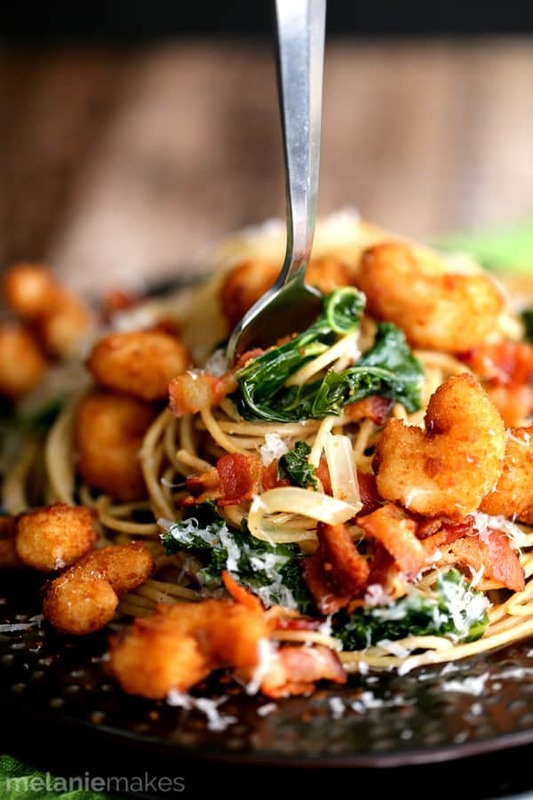 Kale for breakfast, shrimp for lunch, and all the bacon and pasta for din din! :-D This recipe needs to happen A.S.A. on the P.! 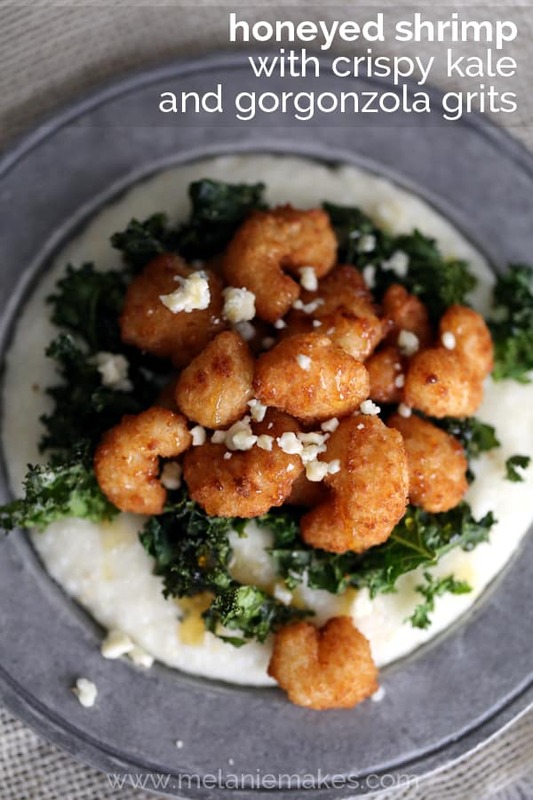 Woman, you are totally rockin' these popcorn shrimp lately! This looks amazing, I love every last thing in it. And popcorn shrimp is officially on my shopping list. Thank you so much, Heather! Love that they're always ready in the freezer for my next recipe! Such beautiful photos. I love that it's so simple to put together but certainly doesn't look like it is. You're so kind, Joanie - thank you! Shrimp and bacon, I'm in! That's so funny that you get more excited for a snow day than you kiddies. This dish looks incredible! This look so fancy, but seems so simple. I have to make it for the hubby! Miranda, even my girls' teachers know that I get more excited. LOL Thank you so much for your kind words! You're so sweet, Ashley - thank you! And the things my 4yo will say to me - she's crazy! Well I have to say that I am jealous. We don't get snow days out here in sunny Palm Springs, Ca. Can I come stay with you, hehe. I would be so excited to stay home all day. I get excited for non-school days cause then I don't need to get dressed, ha. This pasta looks easy and delicious! I need this in my life. Yum! Pinned! This is giving me a serious craving for popcorn shrimp. Ha! It's been way too long. And your kids totally are the luckiest. I'd eat this for lunch any day! Just think how lucky your little one will be with everything that you'll be making for him/her! I kinda want that whole dish in front of me right now! I love shrimp and bacon so much you don't even know! 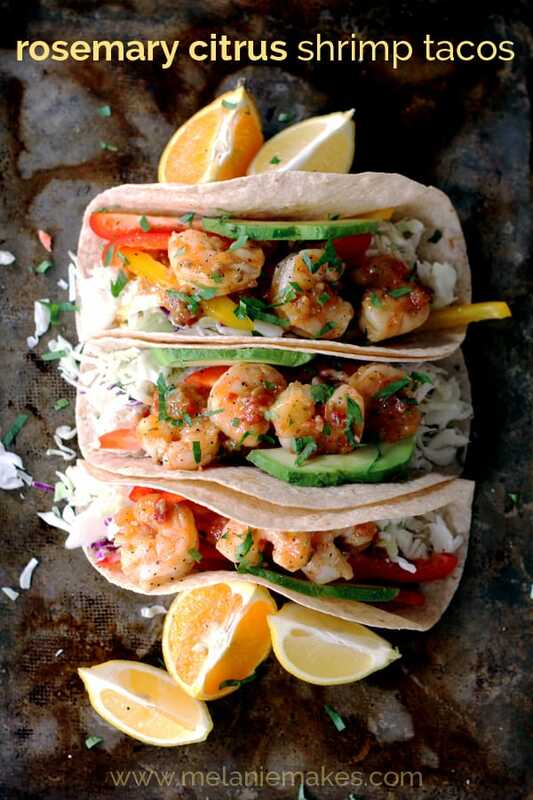 My kids love shrimp - we all do! This pasta looks crazy good! Thanks, Stephanie - I bet you and your family would love this pasta! Snow day lunches serve double duty as recipe development - definitely not the norm! Thank you so much, Lexi! Wow that is quite the snow day lunch! I'd like to come to your house! :) Pinning and sharing because I'd like to try this...it's definitely up our alley! Thank you so much, Michelle! I love staying in and baking/cooking the day away on a snow day! Looks fabulous! I love a good shrimp pasta recipe. They're such a perfect match, aren't they? Thanks, Julia! That breaded shrimp topping this dish is mouth-watering! Gorgeous! GAH! The last photo with the fork...my mouth is DROOLING! I don't have kids to experience the snow day shenanigans...but I want this pasta everyday, ALL day! Pinned! See - you need to move closer, Taylor! I'd gladly share!